Aizuwakamatsu. We stayed at the Kutzurogijuku Chiotaki. This is a first class onsen hotel—the hot bath is on the top floor so at night you get the vista of the city, below, while you are soaking in the soothing waters. And the food is fresh, local and excellent. We spent one day in the popular market town of Oouchijuku before returning to visit the sake breweries, the samurai house and the castle. Yamadera. The 1000-step climb to the top of the mountain is not too taxing and on the way, in the Autumn, you see beautiful changing leaves, small temples, shrines and Jizo statues. It really is an experience of a lifetime. Sendai. The Westin is a great place to stay—very close to the train station—amazing view from the rooms—very friendly service. We visited nearby Matsushima --so pretty—and so much to see—as well as Shiogame—with its incredibly fresh seafood. Part of the beauty of exploring Japan is that there is always something new to see, taste and experience. In November 2013, with the support of the City of Tokyo, I ventured to the Ogasawara Islands. Hiraizumi. Rent bicycles to visit the two temple areas. Again the autumn leaves wholly complemented the temples, the tall trees, the nottoo-difficult mountain climb and the pond. Once on Chichijima, we were overwhelmed at the friendly nature of just about everyone we met. Our tours were filled with beautiful scenery, wild octopus trees, hidden beaches and walking trails. On our second evening we joined a small group to look for bats and glowing mushrooms. The bats were hiding that night but we did manage to find one fluorescent mushroom as well as huge hermit crabs on the beach. Our cruise around the island—a snorkeler’s, scuba diver’s and swimmer’s paradise—was also, for me, a wonderful photographic opportunity. We also visited Hahajima—known for its walking/hiking trails and unique species of flora and fauna that not only gave rise to the nickname-the Galapagos of the Orient-but also contributed to the UNESCO natural heritage designation. 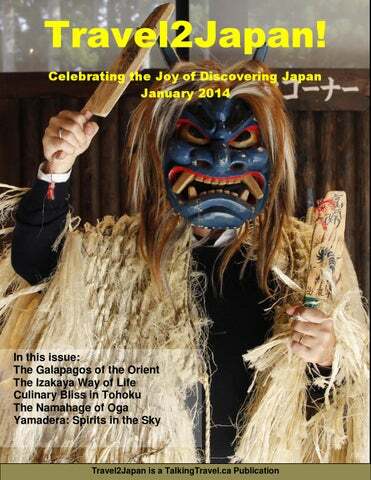 Namahage (see the story in this magazine) Hirosaki: The castle, temple street and the Neputa Museum are must sees. Aomori: Our tour guide, Qiu was terrific and he took us to so many interesting places that showcase the history, art and cuisine of the region. The Nebuta Museum (see back cover) is simply excellent. Back in Tokyo we stayed at one of our favourite properties, the Courtyard by Marriott Tokyo Ginza Hotel: Great comfort, service and location. 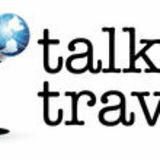 r Other adventures in Tohoku will be covered in the .Spring edition of Travel2Japan. After returning to Tokyo, we enjoyed ten days exploring the Tohoku Region, with the support of the Japan National Tourism Organization. And every day was filled with amazing “new things”. I say that because the trend in travel today concentrates on “what else” you can do. And in Tohoku there is no much. I’ll admit that the one thing that stood between me and the Ogasawara Islands, which lie 1000 km to the south of Tokyo and are part of Tokyo Prefecture, was the mode of transportation. The only way to access the Islands is by Ferry and the ride takes 25 ½ hours each way, assuming the weather and the ocean cooperate. Despite lingering memories of notso-pleasant past experiences, I decided to be bold and confirm the arrangements for the trip. In preparation for the ride I marched into the local drug store and purchased trans-dermal patches to be applied behind the ear, as well as sea-bands—to stimulate the acupressure points on both wrists, as well as Gravol tablets-just in case the first two solutions didn’t work, and then, for good measure, a bottle of Advil, just in case the whole affair gave me a headache. I don’t think I went overboard with my concerns. All my fears were for naught and my decision to proceed with the trip was more than affirmed with engaging people, amazing scenery, delicious food and adventure! Known for many years as the Bonin Islands (from the Japanese word bunin, meaning ‘no people’ or ‘uninhabited’), Ogasawara takes its name from Ogasawara Sadayori who claimed (some say falsely) to have been granted the islands in 1593. Ogasawara itself is an archipelago of over 30 subtropical and tropical islands, with only two of them inhabited: Chichijima, or Father Island, has a population of roughly 2000 and Hahajima, or Mother Island, has a population of 400. The attractions of And what do you do for 25½ Ogasawara lay in hours? Well, when you take secluded beaches, into consideration time for hiking, boating, sailing, napping, eating, becoming snorkeling, scuba diving, mesmerized by the emptiness sea-kayaking, whaleof the ocean and the swelling watching, swimming with of the waves, taking photos, wild dolphins, fishing, watching some television, conservation, as well as reading, chatting, peoplethe sheer uniqueness of watching, having an Asahi experiencing the Beer or two and sleeping, destination (what many then all of a sudden it’s 11:30 travellers refer to as the am the next day and exactly ‘what else’ in travel). 25½ hours after we left Tokyo, Plus it is important to we arrived in Chichijima. note that the Ogasawara Our tour guide, Katchan, offers a taste of the fruit from the Octopus tree. group was formed by We checked into the Seafront underwater volcanoes 48 Hotel (about an 8-minute walk million years ago and were never attached to a from the Ferry Dock-it’s a very small town). It land mass. They became home to a number of offered basic accommodation but it was neat unique species of flora and fauna, a fact that and clean and afforded a nice view of the main has given rise to the nickname, The Galapagos street from our balcony. We then roamed the of the Orient’. town and settled on a Ramen restaurant for a delicious bowl of mixed seafood ramen. After spending a few days in Tokyo, we arrived at Takeshiba Pier on a cool November day and Back at the hotel Katchan, our guide from the at 10:00 am we departed on the Ferry, the Nature Academy introduced himself and we set Ogasawara Maru. Our First Class room was on off for an orientation tour of the island. We the 2nd level and contained two bunk beds, a stopped at amazing lookouts to enjoy vistas of window, and a small television. the city, the harbour and the smaller islands in the area. buns and pastries got the better of us so we sat on the porch for a breakfast of coffee and baked goodie. Then we hopped across the road to the harbour and met our cruise boat, the Pink Dolphin for the seven-hour circle tour of the island. This was a day of absolute wonderment; sunshine, incredible land formations, wild dolphins cavorting with snorkelers, secluded sandy beaches, mysterious caves, curious albatrosses, two smiling goats, and three foot waves that quickly calmed down to resemble a soothing, rolling, carpet. The cruise provided the opportunity to swim, snorkel, photograph and become absolutely entranced by the features of the island that contributed to the Ogasawara group being named a UNESCO Natural World Heritage site in 2011. One of the more interesting sites that we passed a few times, was the Heart Rockâ&#x20AC;&#x201D;a rocky formation boasting a red-tinged heart-shaped figure. (see P.3) We had passed by the Heart Rock CafĂŠ in town, but thought it was just a touristy take-off on the famous Hard Rock chain. In actuality, it was a celebration of the local Heart Rock! such a warm and heartfelt departure that it made us sad to be leaving. While the islands are mostly geared toward Japanese-speaking visitors, they do attract Europeans, Americans and in this case, one Canadian. Still, I managed to find people who spoke a bit of English and mixed with my even less bit of Japanese, I had a wonderful time. The Ogasawara Islands are most likely a destination that few travellers--and even travel agents--know about, but they do deserve attention. Throughout the trip I kept thinking of the Monty Python lineâ&#x20AC;ŚAnd now for something completely differentâ&#x20AC;?. In the case of the Ogasawara Islands, this is absolutely true. Top Left: The Captain of the Ogasaware-Maru, Isami Takahashi; Top Middle: Lining up for the opening of the bakery on Chichijima; Top Right: Crab Crossing signs can be found on both islands; Middle Left: “Gyosun” or “Fish Sandals”. Everyone on the islands wears them. Middle Right: The final ascent of Mount Kofuji, Hahajima; Bottom Right: A WWII gun in a hidden cave overlooking Minamizaki Beach and the Pacific Ocean, Hahajima; Bottom Left: One of the many picturesque rock Islands as you circle Chichijima. We discovered Ohanabo by wandering the small streets of Sendai. The Izakaya is very friendly (as you can see) with a very good selection of sake and very tasty, fresh food! Top Photo: Tsuzuku’s famous Wasabi Rice. 2 : Grabbing handfuls of nori (seaweed) to soak rd th th up some of the heat in the dish. 3 . Lots of nori helps! 4 : Tears flow 5 : Bananas are th distributed to further lessen the effects of the Wasabi 6 : Steve Gillick, red eyed but happy. And other local dishes including Ikano Goroyaki (squid grilled in squid ink and special sauces), Grilled white fish with Miso and Shishamo (small fish with eggs inside—you eat everything!) Torayah: Just north of the castle and temple in the city of had Morioka, we walked into an old izakaya where just about every seat was occupied by businessmen. As the crowd slowly headed home, we started to chat with the owner and then other patrons became interested in the Canadian connection. By the time we left several hours later, we were taking photos with the owner and her daughter and some of the other ‘regulars’. It was one of those comfortable evenings where everyone interacted like old friends—with ourselves included. And the food was amazing. Recommendation: the Octopus and Scallop sashimi, but literally everything was great. Aomori Tsugaru Joppari Ryoya Sakaba When in Aomori, look for the three huge Nebuta heads and you will have found this Izakaya. (The Nebuta festival takes place in the autumn and attracts thousands of people to watch the colourful floats). The Izakaya is pretty good— you sit at a large squared counter, the service is very attentive, the food (lots of local dishes) is tasty and well prepared and at some point during the meal a sameshin (three-stringed instrument) player will serenade the diners. It’s a fun, relaxed place to spend an evening. Also on my list: On my many trips to Japan, I’ve had some great Izakaya experiences. So as not to leave them out of my “Izakaya Way of Life” list, I would like to at least mention them. Yasubei –Yokohama—specializes in Yakatori. Have been there a few times. Saka-eya—a tiny Izakaya in Yokohama with incredibly good food. The Niseko Club, Niseko Village (Hokkaido)—try the grilled Hokke—very friendly service too. Goro (Niigata)—excellent food. This is a larger Izakaya but the service is very personal. Need to make reservations a few days in advance. Kurokawa, Fukuoka-a large, popular Izakaya with lots of energy and really good food. Shinki is an Izakaya chain. We had a really enjoyable lunch at the Mitaka location. Joppari Sake has a clear, clean and crisp taste—and a great label! And there are dozens of small izakayas that are rarely visited by tourists, partially due to the language issue, but also there is a bit of an intimidation factor i.e. walking into a 14 -seat restaurant filled with chatting locals. But just about every time we discovered such an izakaya, we ended up having a memorable evening. And a hint: Sit at the counter, if possible. That’s where the interaction takes place between the chef and the patrons and between the patrons themselves. What I refer to as ‘the izakaya way of life’ is a reflection of the current trend in travel to experience, taste, talk, listen, learn, laugh and go beyond the stereotype of the tourist watching the scenery. It is a way of becoming part of the scenery and enhancing the enjoyment and meaningfulness of your travels exponentially. Achieving culinary nirvana involves more than the freshness and quality of the food. It’s a holistic encounter of travel, food, culinary talent, atmosphere, relaxation, conversation, wonderment and awe. In Emperor Wu’s case, the ogres descended from their mountain homes to the villages on the Oga Peninsula in northern Japan whereupon they stole crops as well as young women. The villagers came up with a proposal to which the Ogres agreed. If the Ogres could build a flight of 1000 steps from the village to the top of the mountain in one night, then they would be provided with whatever they wanted. However if the Ogres failed, then they would have to leave forever. The Ogres set to work diligently building the staircase. As they completed the 999th step, one of the villages imitated the call of the rooster and the Ogres, thinking that dawn had arrived and they had failed at their task, fled the village, never to return. also have also wanted to dress-up). After the mandatory photos, we entered the exhibit hall filled with Namahage figures representing New Years traditions in the different villages on the Peninsula. The eerie soundtrack whispering ‘whoa, whoa’ as if it was a weird, whistling, supernatural chant, filled the hall. I have to admit that as a serious collector and admirer of masks, I was in seventh heaven. During my stay I’m pretty sure that I took a photo of each of the 100+ masks on display. We visited the Museum theatre to watch a performance depicting a typical Namahage encounter on New Years Eve. After noisily stomping their way into the home, the Namahage sought out the kids in the audience, only to be greeted with smiles, giggles, and feigned terror, as the parents had told their kids beforehand hat to expect. The visitors then sat down with the head of the household to ‘negotiate’ for better behaviour in the New Year and then, appeased with a cup of sake, they grimaced at the kids in the audience once again and then departed. It would not have been a complete visit without ascending the stairs to the mountain shrine (not a very high climb at all) to pay tribute to the kami (spirits). On the return, the outdoor restaurant ‘shack’ was open so we dropped in for a traditional snack of Shinzan Sake (named after the Shrine and the Mountain) and a taste of Gohei Mochi (grilled sticky rice that has been coated with a special miso sauce). Afterward we then had the pleasure of meeting with Chiaki Ishikawa, one of the expert mask makers and watching him put the finishing touches on one of the carved wooden masks. There is a souvenir shop that sells masks of all sizes. The days surrounding New Years represent an occasion for many societies and cultures to toss out the old, say farewell to bad luck, promise to turn a new leaf and strive to attract good karma for the New Year. The frightening ogres of Namahage are part of this enamoured tradition. While I thought about visiting the Tohoku Region of Japan for several years, the thing that pushed me into action was a photo book on some of the temples. When I saw Yamadera, I decided then and there that I had to visit on my next trip. Walking toward the mountain, we crossed the red bridge over the Tachiyagawa River and then started to see the signs in the shape of monks pointing toward the entrance to the route to Yamadera. Itâ&#x20AC;&#x2122;s a very short walk from the train station. We took an early morning local train from Aizu Wakamatsu to Koriama, then a Shinkanzen (Bullet train) to Yamagata and then a local train to Yamadera. The journey took a little more than three hours. When we arrived in the Yamadera train station, the sky was overcast but the leaves on the mountain (yama) were brilliant reds and yellows and oranges, and the temple (dera) was clearly visible. The first temple is up a short flight of stairs and sets the tone with a large Buddha at the entrance, with six children clamouring all over. Nearby are clusters of Jizo statuesâ&#x20AC;&#x201D;usually associated with protection of travellers, as well as caring for the spirits of deceased children and easing the grief of families. Each Jizo (the word means â&#x20AC;&#x153;earth treasury or earth womb) is clothed in the traditional red bib, symbolizing safety and protection. And the tranquil, reflective mood of the temple is reflected by the presence of a statue of Matsuo Basho, the famous Haiku poet who visited Yamadera in 1689: deep silence the shrill of cicadas seeps into rocks After paying the admission (300 Yen per person) to enter the main temple area you ascend the pathway and the 1000 stairs to the top of the mountain. The leisurely walk takes in the tall trees, statues and rock shrines where pilgrims have left coins in the crevices. A gateway leads to the main temple and the lookout over the valley and the mountains. Itâ&#x20AC;&#x2122;s quite breath taking. We got our horoscopes from one of the shrines and then, in traditional manner, we tied it to a frame so our hopes and wishes would be carried by the wind and determined by the spirits in the sky. We slowly walked down, getting a whole new perspective of the temple and the mountain. At the base we saw one of the macaques (monkey). As it was lunch time, we found the recommended spot, Taki Fudo Nama Soba and had some of the freshest tempura soba we had ever eaten. And then it was back to the train station and eventually the town of Kaminoyamaonsen for the evening. Considering that a photo of the Temple at Yamadera had inspired our entire nine day visit to Tohoku, it was certainly a memorable visit and a sensory feast of colour, calm and reflection. Highly Recommended. .